A business idea born in a Harvard classroom to improve the delivery of vaccines in developing countries has been selected as the grand prize winner of the Harvard University President’s Challenge for social entrepreneurship. Vaxess Technologies, a Cambridge-based company founded by students from across Harvard, will receive $70,000 to support a plan to commercialize new technology that uses silk to stabilize routine vaccines and eliminate the need for refrigeration in transport and delivery. Valenti met his President’s Challenge teammates last fall during the Harvard Business School course “Commercializing Science.” The team has been advancing the idea since that time and this spring entered the President’s Challenge, Harvard’s first University-wide student project competition focused on developing entrepreneurial solutions to some of the world’s most important social problems. 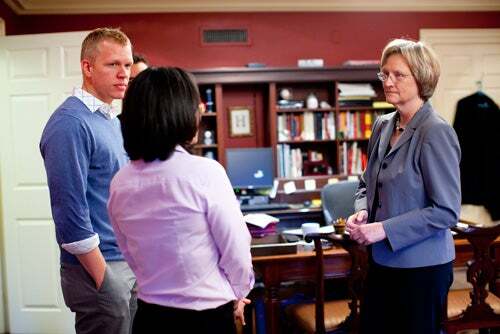 The challenge was sponsored by Harvard President Drew Faust and hosted by the Harvard Innovation Lab (i-lab) to help students develop their ideas and create ventures of high social impact in five categories — clean water, personal health, empowered education, global health, and clean air — while in school. In addition to the Vaxess team, SPOUTS of Water in Uganda, Revolving Fund Pharmacy in western Kenya and School Yourself were also named winners in the competition. As runners-up, each team will receive $10,000 to advance its project. SPOUTS of Water is a team of Harvard undergraduates seeking to increase access to clean water in Uganda by creating a self-sustaining ceramic water filter factory. By producing ceramic filters in Uganda, the team can lower costs of the filters and increase social entrepreneurial opportunities in the country. Revolving Fund Pharmacy is a team working with government health agencies to ensure reliable stocks of drugs at affordable prices in western Kenya. The team launched three pilot revolving-fund pharmacies in western Kenya last year. These pharmacies have served more than 17,000 patients who otherwise would have been forced to pay substantially higher prices for medicine at commercial pharmacies or go without it. School Yourself, a team led by two physics graduate students, is creating interactive electronics textbooks in math and science for high school and college students. The team is producing books for a new digital media generation by utilizing a variety of learning methods, including audio, video, and touch-based interactive tools. The team developed its first book, “Trigonometry,” and is planning interactive books on calculus, mechanics, electromagnetism, quantum mechanics, and probability and statistics. The Vaxess team aims to commercialize a technology developed by Tufts University Professors Fiorenzo Omenetto and David Kaplan. The technology involves extracting fibroin, a protein found in silk, to stabilize vaccines at temperatures of up to 45 degrees Celsius. By transporting and delivering vaccines on a thin filmstrip of silk-derived protein, the need for refrigeration is eliminated. Schrader, M.B.A. ’12, and Valenti are joined by Kathryn Kosuda, a former Harvard postdoctoral fellow in chemistry, and Patrick Ho, J.D. ’12. This summer, the Vaxess team will receive space in the i-lab, two expert mentors, and full access to the resources of the lab through August, as they continue to develop and execute their plan. The grand prize winner and runners-up were selected from 170 teams that submitted project ideas in March. Ten finalists, chosen by a committee of Harvard faculty and alumni, in April received a $5,000 grant to further their projects — along with space at the i-lab and expert mentorship to advance their ideas. The judges, expert practitioners in the global issue areas, found four teams deserving recognition. Vaxess received a prize large enough to help launch it on the path to commercialization. In addition to the President’s Challenge grand prize, the Vaxess team also won the Harvard Business School Business Plan Contest this year and is a finalist in MassChallenge’s annual $1 million global startup competition and accelerator program.